Maybe it’s my artistic and graphics background; maybe it’s just something that has been in me since I was a child. 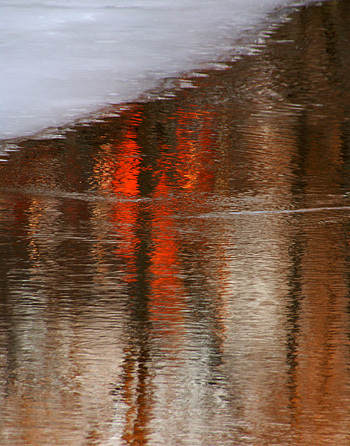 Whatever it is, it’s not something that I ever thought about consciously as I was developing my photographic style. Indeed, I wasn’t even aware of it until several years in when I started seeing a common theme to a lot of my work. But once I realized it, there it was, staring me right in the face… I was attracted by strong color, shape and form. It seemed that most of my best and most striking images contained at least one of those qualities; and often they had all three. Now that I realize this propensity and ability to see blocks of shape and color I seek them out even more, and I see them in some unconventional locations. This image was taken during a snowstorm last winter. I don’t often go out shooting during a storm, because it can cause problems with the gear. You have to be careful which direction you shoot. But anyway, I made my way down Lisbon Street, mostly documenting the downtown in a storm, but at the same time trying to be a bit artistic about it. 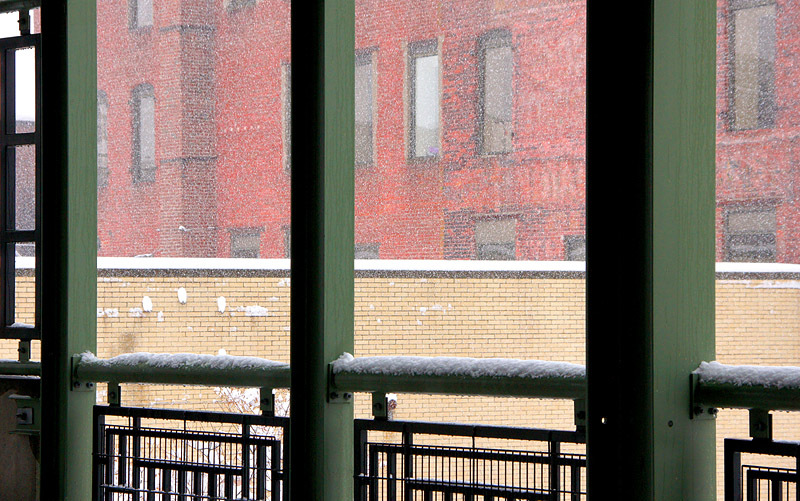 When I got to Oak Street the shelter of the parking garage beckoned, offering a bit of respite from the wind and snow; so I obliged. Once inside I was free to point my camera in any direction without getting the lens wet. As I walked around, looking from the inside out, a whole new world of possibilities opened up to me. I was seeing the same buildings I saw before, but now they were framed by the columns and rails of the garage. What was before just a couple of buildings with no special qualities now became the backdrop of an image that was broken up into blocks and shapes by the columns directly in front of me. And furthermore, the red and yellow of the two distant buildings now added the color that I crave in an image… and these colors themselves created more shapes. And to top it off I was blessed with horizontal line, vertical lines and diagonal lines. I had it all. The two buildings by themselves, viewed from outside the parking garage, while interesting for their contrasting colors, do not have the same impact on their own. Not until I viewed them from inside, framed by the rails and columns did the whole picture come together for me. It now had everything that attracts my eye in a photograph. These images are all around; in nature and man made. One just has to be attentive to their surroundings, and learn to look at the details, rather than the big picture.